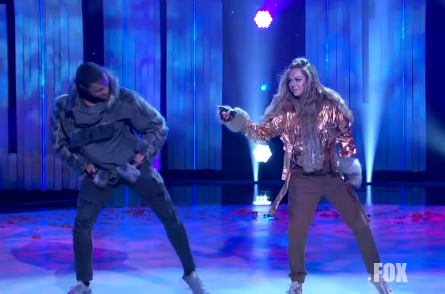 The Top 8 dancers on season 15 of FOX’s “So You Think You Can Dance” (SYTYCD) opened this week’s performances with a stellar avant garde routine choreographed by Christopher Scott. The opening number started with the Top 4 men each on separate platforms underneath rope, then joined by their female partners. The Top 8 dancers are: Genessy Castillo partnered with Slavik Pustovoytov; Cole Mills with Hannahlei Cabanilla; Jensen Arnold with Jay Jay Dixonbey; and Darius Hickman partnered with Magda Fialek. The “So You Think You Can Dance” Top 8 danced two duets this week, along with dancing a solo number each, then two more group routines. This week also introduced a couple of new choreographers to the show, along with some returning favorites. The first number of the night was by fan favorites Jensen Arnold and Jay Jay Dixonbey. Genessy and Slavik danced a contemporary number choreographed by Mandy Moore. Twitch stated that the commitment level is at 100. He added that Genessy is the other side of this power couple. Mary said she couldn’t believe that they thought they were under the radar (which they stated in their video package). She called them the biggest surprise couple of this season of SYTYCD. Mary reminded Slavik to “point those toes” and told him he’s getting it and growing. She told Genessy that there’s a “regalness” about her, just sitting on Slavik’s shoulders. “There is love in the air!” Nigel said it’s going to be on the news tonight that Slavik pointed his toes! Magda and Darius were given Hip-Hip choreographed by Pharside & Phoenix. The concept of the routine was they were wolves with a fierce strong character in order to succeed. Twitch said the execution of their routine was NOT that great, and he thought Darius shined more than Magda. He said she never found her back, and could see that she was thinking about it a lot. Mary reacted that Magda is out of her element but fought for it with every move and can see her determination. She praised Darius for a great come bck from when he got cut in Hip-Hop last season. Nigel said it didn’t really work for him. Vanessa agreed with the rest of the judges. The two had to learn a Broadway routine choreographed by Travis Wall. It was Wall’s first Broadway choreographed piece, although he started-out as a Broadway dancer before he went into Contemporary. Nigel said Cole made the routine “brilliant” and it’s one of the best things he’s seen Cole do. He told Hannahlei that she does everything magnificently. Vanessa said Hannahlei is literally like sunshine. Twitch reacted that this is one of the most honest performances he’s seen from Cole over the past few weeks and he’s stepped-up his game. They did contemporary choreographed by Jaci Royal. The theme was about an unhealthy relationship The moves required them to be literally tangled in rope and getting untangled. The top 4 women danced a Contemporary routine. Nigel complimented Magda for keeping-up. Vanessa said the emotion and presence was piercing from their eyes. Twitch told the women that the audience needs to make sure that they vote to keep their favorites on the show. Mary said they are making it incredibly diffiicult for the voters. Host Cat Deeley read the first of the voting results. The first name called was Jensen as safe. The next name was Magda who was in the bottom four. Then Genessy was also revealed as in the bottom four. Hannahlei was safe and moving-on. The next routine came from the top four men choreographed by Luther Brown. The judges gave the men a standing ovation and started swaying like a move in the routine. Vanessa said it’s the most icey in the studio and it was “so fly, and so fresh!” Twitch said it was so incredible and told America to make sure to vote! Mary said she loved how all the men had their own moment to shine in the routine and they all brought it to the table. Jay Jay, Mary said, stood out tonight. Nigel said it was Darius who stood out for him. “The smallest movements just make the routine and shine” thanks to Luther Brown. Jay Jay was announced as safe. Cole was revealed as being in the bottom four. Slavik was revealed as safe. That meant it was Darius who joined Cole in the bottom four. Nigel said the voting is positive on the show. “No one is voting you out.” Nigel called Cole to the front and said he had a fabulous night tonight, but wish he had a better week last week. Nigel called Darius “fabulous” but hasn’t connected with the audience tonight. Nigel called Magda and again said he doesn’t know why she’s in the bottom. Nigel credited Genessy for helping her partner (Slavik) a great deal which many people don’t realize. Nigel voted out Cole and Magda because the voting gap was the greatest with the two.